Recently, the Central North Carolina Region hosted the Rev. Charles Vavonese, Chaplain for the Syracuse Region, and the author of the booklet, “I am the Resurrection and the Life, A Resource of Catholic Moral Teaching on End-of-Life Issues,” for a Defense of the Faith presentation. “At a time when there are so many voices contrary to the Gospel of life, we thought it was important as knights and dames of Malta to sponsor Father Vavonese to speak to our community in defense of our faith, particularly as it relates to end-of-life issues,” said Msgr. Anthony Marcaccio, chaplain of the Central North Carolina Region. 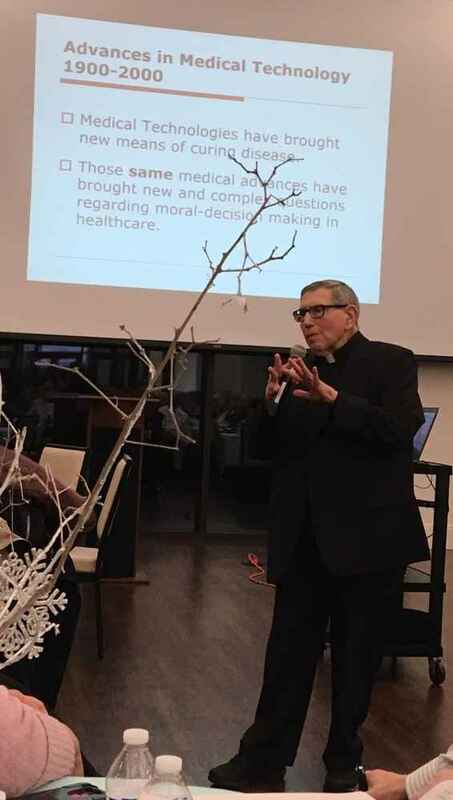 Father Vavonese pointed out that the advances made in medical technologies that are curing diseases could be a source of anxiety, since they bring new questions and concerns about medical treatment and moral decision-making. Father touched on many important topics during his presentation such as: taking the middle course between vitalism, which holds that everything possible must be done to keep the heart beating, and subjectivism, which holds that life only has value as long as the individual believes that it has value; what ordinary means should be used to preserve life; what are the ethical and religious directives regarding assisted nutrition and hydration; palliative care for the terminally ill; Do-Not-Resuscitate orders; living wills; health care powers of attorney; medical orders for life-sustaining treatment; and opposition of the Catholic Church to physician-assisted suicide. Some participants were visibly moved by the presentation, and others expressed relief to learn that decisions they had made for their relatives had been consistent with Catholic teaching. Msgr. Marcaccio urged all of the participants to prepare an end-of-life document that reflects Catholic teaching, and to have a clear, real, loving conversation expressing your wishes to the person you have designated to make decisions for you when you are unable to make them for yourself. “A carefully written legal document maybe helpful in knowing one’s desired course of medical care,” he said, “but pales in comparison to having designated a compassionate individual whose conscience has been formed by our faith. Father Vavonese’s presentation was a gift to all who heard it, as it offered answers and peace to those who had been wrestling with these issues in their own lives and in the lives of their loved ones.